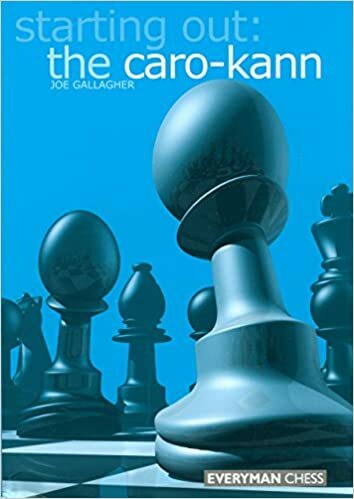 Today I finished going through Starting Out: The Caro-Kann by Joe Gallagher (Everyman Chess, 2002). This is actually the third time through the book for me, in addition to having used it as a reference when looking at particular variations. However, this was the most comprehensive run-through that I've done of it, so I believe it's worth reporting on, especially since I haven't discussed it before in-depth. Per my usual practice, I went through the book with a chess set in front of me, playing through all of my chosen lines and illustrative games. This time, I also at least read through most of the sections on alternate lines, even if they're not included in my existing repertoire. I found the whole process most useful in: 1) re-exposing myself to the middlegame plans in each key line, and 2) re-evaluating certain variations I play and opening myself to alternatives that I had previously dismissed. The book is not meant to provide a comprehensive treatment of the opening in all lines, but it is still the best single-volume introductory work on the Caro-Kann that I've seen, with excellent coverage of some key variations. The author is not himself a player of the defense, but rather is a 1. e4 player and has prepared a number of different variations over the course of his career against it. While at first this lack of direct experience as Black seemed a little strange, I now in fact greatly appreciate it; the author's evaluations come across as more objective than those in many opening manuals and the point of view is more balanced between White and Black. Formatting: I find the single-column format used by the Starting Out series to be very readable and it is designed for larger amounts of text, rather than variations. I found the diagrams in this book to be generally more illustrative of key positions and less awkwardly placed than in other books in the series that I've seen. Typos: I only found two move typos, which is on the high end as far as editing quality for chess books go. Classical Variation: this was both the best (in my opinion) and personally most useful section of the book. While some of the earlier sidelines (such as 5. Nc5) aren't fully examined, the overall treatment of the variation is quite meaty and the various different approaches for both sides are explained well. This is a variation in which theory is usually well-developed until at least moves 10-12, so I appreciated the author's efforts to highlight typical middlegame plans and ideas, rather than simply giving an evaluation at the end. Other Main Line variations: the author provides similarly deep treatment (two chapters) of the 4...Nd7 variation, which Karpov popularized, but only one chapter on the 4...Nf6 lines. This arrangement is warranted, given the popularity and perceived effectiveness of the variations in question. For example, if you're interested in the Tartakower Variation (5. Nxf6 exf6) there isn't a lot of material. However, it's probably not in the author or reader's interest to dedicate much time to inferior and unpopular variations. Advance Variation: this is now the most popular at the GM level and the book provides a good treatment of both the main response (3...Bf5) and the alternative pawn sacrifice line (3...c5). The latter section isn't comprehensive enough to provide a basis for a repertoire, especially given the evolution of the line since the book was published, but it is a good place to get started. Given the relative lack of attention to the 3...c5 lines, it's also useful to see an author (coming from the White perspective, no less) treat them seriously. Panov-Botvinnik Attack: another strong section, where all three of Black's main alternatives (5...e6, 5...g6 and 5...Nc6) are presented with some depth. For Class-level players, I would say that enough material is given here to provide a solid foundation for a repertoire. Some of the 5...e6 lines will transpose into heavily-studied opening positions with a lot of branches, which means they are outside the scope of this book and will require more individual research by the player. Fantasy Variation: this variation (3. f3) is a personal favorite of the author and the section on it was particularly welcomed by me. Theoretical works on the Caro-Kann generally ignore or quickly dismiss the variation, despite the fact that it can be quite dangerous for the unprepared player. As a side note, it can also be relevant for defending against the Blackmar-Diemer Gambit (1. d4 d5 2. e4) since I decline it by playing the Caro-Kann (2...c6) and BDG players will likely continue trying to play in the spirit of the gambit with 3. f3. Miscellaneous Lines: the Exchange Variation, 2. c4, and the King's Indian Attack are covered here. While each only gets a small section, there is enough material to flesh out a Black repertoire against each line. The KIA against the Caro-Kann simply isn't very good; as long as Black knows the best moves early on against it, there are no challenges. The Exchange Variation requires more preparation as Black, given that more theory has been devoted to it (mostly in the 1970s). 2. c4 is also something Black players should be prepared for, although it's much less theoretical. Very fine review. Gallagher also did a great job with his book on the Saemisch King's Indian. Speaking of 2. c4 I have played it a few times with success. Most of the time the opponent was very surprised. Thanks for the comment. As an English Opening (1. c4) player, I'm tempted after my opponent plays 1...c6 to play 2. e4 and transpose into the Caro-Kann 2. c4 line, since I think the variation is fine for White. However, I have something of an aversion to playing against my own defense (a well-known psychological phenomenon for chessplayers) so go a different route.